The South Carolina Supreme Court on Wednesday upheld the validity of a North Augusta ordinance being used to finance a new stadium development for the Augusta GreenJackets. The court determined, however, that North Augusta officials violated open-meetings laws by failing to announce the specific purpose of closed-door meetings they held to discuss the development. The 5-0 ruling in effect ends 18 months of litigation challenging North Augusta’s $183 million Project Jackson near the Hammond’s Ferry neighborhood with a baseball park overlooking the Savannah River, a hotel, conference center, and retail, living and office space. 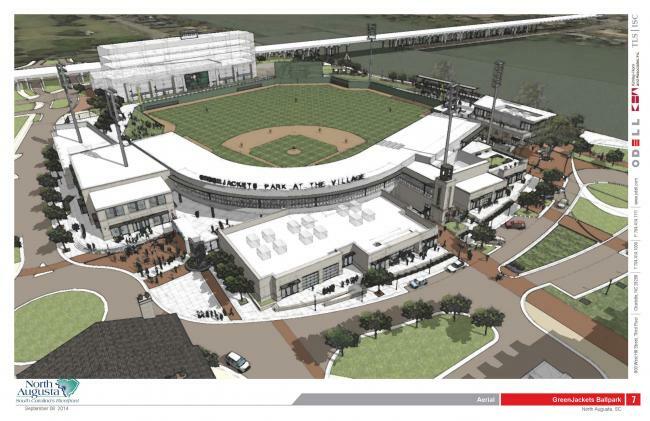 Jeff Eiseman, president of the GreenJackets and team owner Agon Sports and Entertainment, said the ruling allows the team to open its 2017 season in the North Augusta stadium. The stadium was planned for the 2015 season when the city announced plans in late 2012. North Augusta Administrator Todd Glover said work begins to finalize contracts with groups that will occupy the development but were reluctant to sign agreements with litigation pending. Construction groundbreaking isn’t scheduled but the stadium is on track for the 2017 season, he said. North Augusta homeowner Stephen Donohue sued the city in December 2013, claiming the development area did not have blighted property required to amend a Tax Increment Financing District created in 1996. He also said the North Augusta City Council violated the Freedom of Information Act by holding executive sessions without disclosing to taxpayers that council members were discussing Project Jackson. The Supreme Court’s opinion affirmed the August 2014 ruling by South Carolina Circuit Court Judge Ernest Kinard on the TIF District but reversed his decision that North Augusta complied with FOIA. Donohue appealed Kinard’s ruling, and the Supreme Court agreed to bypass the Court of Appeals to hear the case May 5. In an e-mail, Donohue applauded the court’s decision to advance government transparency regarding closed door meetings but said upholding the TIF district allows Project Jackson to disturb the riverfront and city’s quality-of-life. In 11 executive sessions challenged by Donohue, the city council announced they were entering to discuss a “contractual matter,” according to the opinion. Contractual matters are defined as a “specific purpose” that municipalities can use to hold closed meetings but the statue requires more description when the subject involves location, expansion or services for businesses or industries that will serve the public, the opinion says. Zeigler said North Augusta followed the FOIA as the city and some other municipalities interpret the law. The court’s opinion called for more specific descriptions that could change how governments conduct business, although it’s not clear how much disclosure must be given, he said. “FOIA is always a balance between abilities of governments to operate with a certain amount of privacy for specific areas and transparency for the public. The court is saying they want to push that balance more toward transparency,” he said. Glover said North Augusta conducted business similar to other municipalities. The city has tried to be more specific about its closed meetings since the Supreme Court expressed concern during the May 5 hearing. “It was pretty evident the day of our Supreme Court case the justices didn’t like how we were going into executive session,” he said. The FOIA violation does not invalidate the funding ordinance because the executive sessions applied to contract negotiations with Augusta GreenJackets owners and project developers, Zeigler said. The Supreme Court required North Augusta to pay attorney fees and costs for the portion of litigation relating to FOIA violations only. Zeigler said the amount has not been determined but the case centered more on the TIF district than FOIA. North Augusta has spent about $250,000 on legal fees for the case, Glover said. Additionally, construction costs increased during the lengthy litigation likely costing the city more to complete the project, he said. The GreenJackets have not signed a contract with North Augusta, Eiseman said. Still, the team is committed to the project and eager to play in the riverfront stadium, he said.